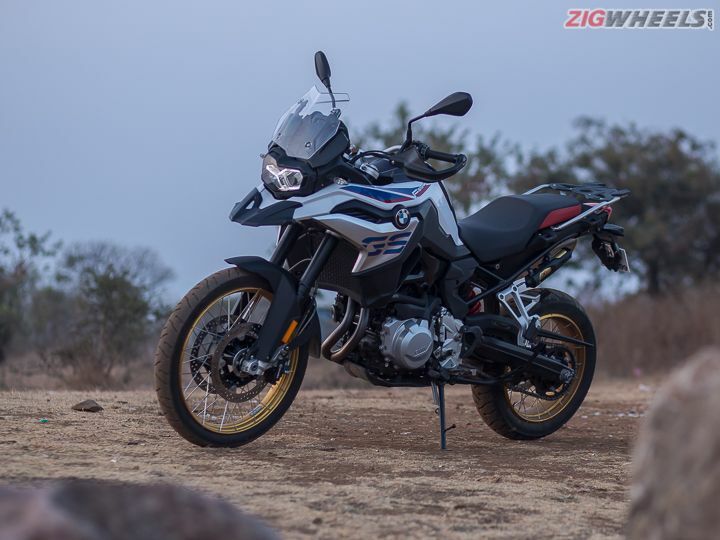 The adventure motorcycling was kick-started by BMW Motorrad as it revered GS brand of motorcycles are known for being the ultimate continent crushing machines. We were introduced with the mid-displacement F 850 GS recently. After riding it over varied terrain, we were thoroughly impressed of its off-roading capabilities but we wished it was just as enjoyable on the road. You can read the review in the link below. However, here are a host of images of the middle-child of the GS family. The F 850 GS is one of the two GS motorcycles that are based on BMW's 853cc parallel-twin platform. The 850 is the more purposeful of the two siblings and it certainly looks the part. The aggressive beak is short and flows well with this function-over-form design philosophy. It is built like a tank. Everything on this bike feels well put-together. There is no skimping on quality of plastic used as the panel gaps are exremely consistent. The switchgear quality is top-class but it is not the most intuitive to use. The standard motorcycle gets a semi-digital console but our test bike came fitted with the optional colour TFT screen. You can tune your bike's riding setup, control your music, navigation and act as a hub for helmet headsets. But in order to get this screen, you will have to shell out Rs 60,000! The riding stance might be a bit unwelcoming for short riders. Heck, even for riders who are 5 feet 10 inch can just barely tip-toe the motorcycle. Especially, when the preload settings raise the seat height by a few millimetres. Even the reach to get to the bars is a bit much as we figure the 850 GS was designed keeping large burly riders in mind. Once you set off, the 850 shoots ahead with much vigour. Rev the 853cc mill past 5000rpm and it goes a bit mental. There is a distinct lack of low-end torque and it does not have the tractability of a Triumph Tiger 800. You can sustain speeds up to 120kmph with no fuss. However, the bike tends to lug if in case the speeds go below 60kmph and you are in the sixth cog. On the Pro version (the model that we tested), you get four riding modes - Rain, Road, Sport and Enduro - plus an additional Enduro Pro mode in which you can dial down electronic intervention right down to a bare minimum. Plus the variant also gets a Gear Shift Assist. It basically works similar in principle to a quickshifter but it isn't as slick as quickshifters usually are. Out on the highway, that ridiculously small windscreen offers little-to-no wind protection at high speeds. And you are accompanied with weird wind noises inside your helmet. So our suggestion is to chip in for an aftermarket windscreen. The top-heaviness makes it a bit lazy in the bends. There is a bit of vagueness with the front-end which is due to the wide rake angle and also a 21-inch front wheel. The long wheelbase does lend it a fair bit of stability when leaned over. Once you try to venture out into the wild is where you will thoroughly enjoy the 850 GS. The true-blood adventure spirit comes alive as you are able to get past virtually anything in your path. It does manage to mask its weight well as the mass centralisation allows one to be in a better position to control the action when standing up on the pegs. The narrow rider touch points mean you can grip the tank better with ample leverage at the bars to steer clear of danger. While there is no adjustability with the front USD forks, the rear monoshock get electronic adjustability for preload as well as damping. The 21-/17-inch spoke rims come shod with tubeless Michelin Anakee rubber which do a half-decent job on dirt. A more aggressive off-road rubber such as the Pirelli Scorpion Rally Trails or something would make the experience of riding the 850 GS off-road a whole lot better. While it isn't going to be an ideal companion on the road, the F 850 GS is undisputedly the king of the dirty stuff. Hence if you are someone who likes to kick up some dirt more often than not, then the motorcycle makes a whole lot of sense than the Tiger 800.